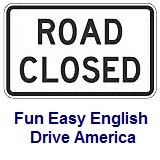 ﻿ Fun Easy English - Drive America - United States of America road signs, rules, and regulations warning, truck. Warning road signs for height restrictions indicate the distance between the road and an overhead obstruction ahead. Warning road signs for the temporary traffic control of height restrictions are used to advise road users of changes in the distance between the road and an overhead obstruction ahead. Warning road signs for the temporary traffic control of vehicular traffic crossings are used to advise road users to locations where unexpected entries into the roadway by trucks, bicyclists, farm vehicles, emergency vehicles, golf carts, horse-drawn vehicles, or other vehicles might occur. Warning road signs for the temporary traffic control of vertical grades, hills, and slopes are used to advise road users of changes in the vertical alignment of the road ahead. Warning road signs for vertical grades, hills, and slopes are used in advance of a downgrade where the length, percent of grade, horizontal curvature, and/or other physical features require special precautions on the part of road users. The regulatory road sign traffic prohibition is used to keep traffic from traveling in the wrong direction and to exclude certain types of vehicles from certain roads. Possibility of trucks crossing the road. Possibility of farm vehicles crossing the road. Possibility of horse-drawn vehicles crossing the road. Possibility of bicycles crossing the road. Possibility of golf carts crossing the road. Possibility of emergency vehicles crossing the road. Indicates that a hill is blocking the view around an upcoming turn. Indicates a downgrade, hill, or slope. Indicates a downgrade, hill, or slope, with an 8% grade. Indicates a downgrade, hill, or slope with a 9 percent grade. Indicates a downgrade, hill, or slope with a 9 percent grade for the next 7 miles. Indicates the condition will continue for the next 7 miles. Indicates a downgrade, hill, or slope with a 9 percent grade for the next 11 kilometers. Indicates the condition will continue for the next 11 kilometers. Trucks are instructed to use a lower gear due to a downgrade, hill, or slope. A runaway truck ramp exists to the right for trucks which are unable to stop on a downgrade, hill, or slope. A runaway truck ramp exists one mile ahead for trucks which are unable to stop on a downgrade, hill, or slope. A runaway escape ramp exists for trucks which are unable to stop on a downgrade, hill, or slope. A 180 degree curve to the right where trucks or vehicles with a high center of gravity should use caution when turning. Indicates that a structure over the road has a vertical clearance of 12 feet 6 inches. Indicates that a structure over the road has a vertical clearance of 3.8 meters. Indicates that a structure over the road has a vertical clearance of 14 feet 4 inches. Indicates that a structure over the road has a vertical clearance of 4.3 meters.